An active PSU ID card is required for any and all levels of MCECS keycard access. Information on where to acquire a PSU ID card can be found on the main PSU website. Firstly, by attending MCECS New Student Orientation (Note: this only works for students). Any non-CS student attending MCECS New Student Orientation is eligible to activate their MCECS Card Access by bringing their PSU ID to EB100 (Student Services). Secondly, by registering for an MCECS class (Note: this only works for students). Any student registered for an MCECS class is eligible for MCECS Card Access and need only bring their PSU ID to FAB88 (for CS Students) or EB100 (All other students). Thirdly, by department Banner update. A department can indicate an individual as eligible for card access within Banner. This is visible to the CAT and the individual is then granted access specified by the department. Once any of these actions have been taken, the keycard access level will be set to ‘PENDING’ and a notification will be sent to CPSO detailing the keycard access to be changed. After 2-5 business days, CPSO will change the keycard access level to ‘ACTIVATED.’ Active keycard access is needed to gain entry to the Fourth Avenue Building, the Engineering Building and MCECS labs within. Firstly, by not attending MCECS classes for 12 months (note: this only happens to students). At this point, your card access is expired and requires a request to the CAT to turn it back on. In addition, going through any of the ways to activate your card access will also accomplish reactivation. Secondly, by departmental request. This happens when a department notifies the CAT that a member of their department no longer requires card access. Card access expired in this manner can be reversed by another request from the department. Thirdly, by administrative action. This happens when a user violates PSU or MCECS policy. When the CAT discovers or is notified of this breach, card access is deactivated and the user notified. 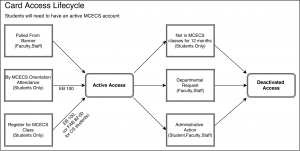 Card access can be regained by completing any of the conditions under “Activating MCECS Card Access. If the breach also resulted in a permanent loss of MCECS account, card access can no longer be restored.